NEW YORK (November 9, 2018) --Two undefeated welterweight's from the Split-T Management stable will be in action in their hometown of Philadelphia, PA as Poindexter Knight Jr. (5-0, 2 KOs) and Mark Dawson Jr. (4-0-1, 3 KOs) will compete in separate bouts at SugarHouse Casino. 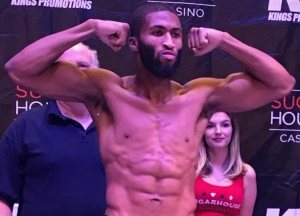 Former National Golden Gloves champion, Knight, will take a big step up in competition as he takes on Travis Castellon (16-2-1, 12 KOs) of Fort Lauderdale, FL in a six-round bout. Knight weighed in at 147.1 lbs while Castellon weighed in at 149. "I'm ready to get in the ring and give an outstanding performance! I train very hard and want to show off my new tricks for this bout. Tonight I will give my hometown something to remember," Said Knight. "Words can't explain how excited I am. It feels like I'm playing in the Super Bowl and the coach is giving me the ball. When the lights come on tonight, you will see me shine!" Dawson said.